This task introduces you to the Superset Web UI, which appears after you sign in. From the UI, you can navigate to the Apache documentation to obtain information not covered in this documentation, such as defining a list of users who can access views, opening Superset functions to certain groups of users, setting up permissions, and viewing user statistics. For more information about authentication in Superset, see the Flask documentation (link below). You are running the Druid and Superset services in Ambari. You ingested data, such as the Wikipedia data from the Wikiticker example, into Druid. The data is records of edits to Wikipedia data. In Ambari, in Services > Superset > Summary > Quick Links, click Superset. 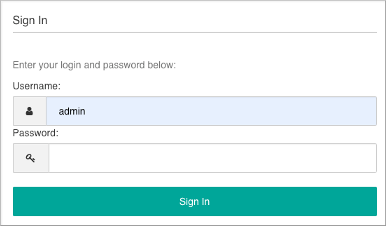 In Superset Sign In, enter the Superset Admin name admin and enter the Superset Admin password that you set up. The Superset Web UI appears. Select Sources > Druid Clusters. 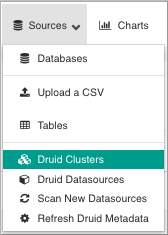 In List Druid Data Source, the wikipedia data source appears. Click the data source wikipedia. The Data Source & Chart Type pane appears on the left. The canvas for query results appears on the right. 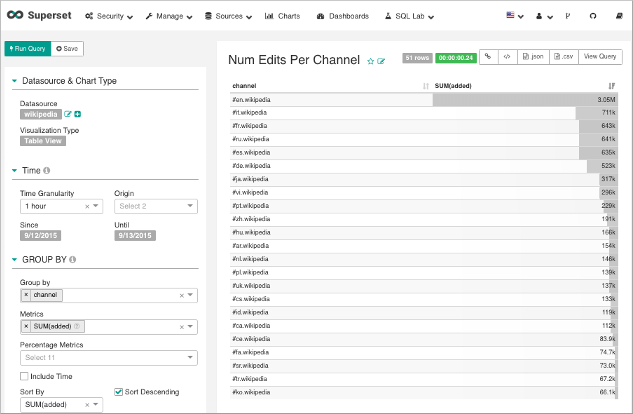 In Data Source & Chart Type, build a query that slices your Wikipedia data. For example, get the top 10 most-edited articles between September 12 and 13, 2015 by setting the following values. In Since and Until, click Free form and enter a date in the format shown above. 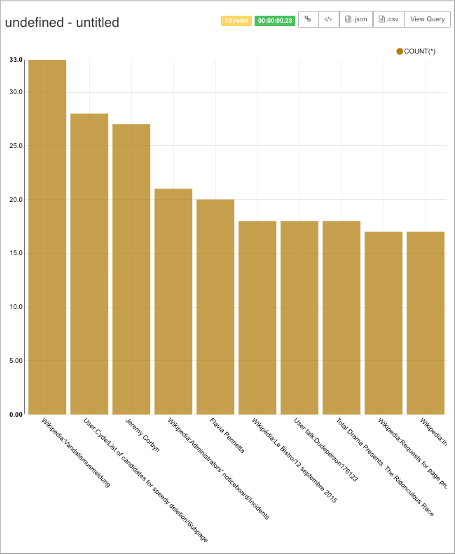 A bar chart appears showing the top 10 articles for the time frame you specified. 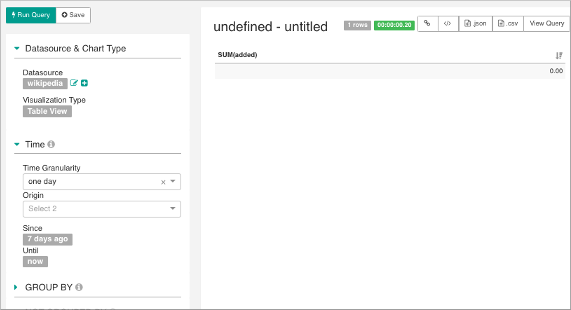 On the canvas, change the default title of the visualization from undefined - untitled to Most Edits by Page Name, for example. Click Save a Slice , specify a file name, and click OK.